Hello, Is Black Ich dangerous? I see my Yellow Tang has one or two Black Spots. From what ive read it doesn't seem to bad. But im gonna ask and just make sure anyways. From what I have read on the net, black spot disease is not as deadly as whitespot. If you can't put the infected fish in a hospital tank to do a formalin treatment than start soaking the fish food in garlic juice. I soak my fish food in garlic quite often. It entices the fish to eat and helps in combating parasites. Reason being is that the garlic is in the skin and supposedly parasites don't like it. Kent makes a product called Garlic Extreme but I get it from health food stores as it is much cheaper. This is from one of my textbooks. The yellow tangis particularly vulnerable to this parasite,but other tangs and sometimes angelfish,butterflyfish, and a number of other species are occasionally infested with parasitic tubellarian flatworms in the genus Paravortex. Like Amyloodinium and Cryptocaryon, these parasitic flatworms can complete their lifecycle in closed systems, and left untreated, can destroy fish in small marine aquariums. A tiny free swimming worm that finds and attaches to the skin or gills of a fish host. The tiny flat worm than feeds on the tissues of the host for five or six days, often moving freely about the fish, before dropping off to complete the development on the tank bottom. After a few days on the tank bottom, the mature worm splits along the side and releases up to 160 young, free swimming worms than seek a host fish. There is no proof that garlic cures parasites. It does make food taste better and in turn makes the fish eat well and keep their immune systems strong. Hi leslie, i've noticed that my 2 clownfish have 2 or 3 black spots on them. I've read about black spots, but they do not have any of the symptoms other than the spots. They are very happy and are eating well, and can't stay away from my nemmie. I already feed them garlic flake food. What else can I do to make the black spots dissapear? in my opinion not much... it eventually subsides... i dont know all the ins and out of it but i have never lost a fish to these symptoms..
How can black ich be removed from a tank? Doesn't help a fish is cured and healthy and as soon as it goes back it gets infected again? Unlike white spot being a parasitic protists, these worms are none toxic to cleaners, so a cleaner of some kind will knock them off nicely. I didn’t put much on our site relating to these because if you have peps and other small animals in the aquarium, they culled them. I found some words on them if you want to have a look. Could corals not sting clowns and they have spots from being stung? Specially when they start hosting a new anemone. From what i know they have to develop a new "slime layer" for that anemone (get used to it's sting). Correct me if i am wrong but i am sure fish stung by corals could also reveal black spots? Yes...hypermelenization...either as spots or blotches...then sometimes the spots also develope because of stress....I had that when I added Canister Filter and also when I removed "Filtration"..(all at once as a Newbie)...then lastly, you get the Black Itch..all in "nutshell version".. Thank you @belindamotion , i did not know the BIG word for it , but knew the basic principle...lol.. There are heaps of reasons an amphiprion could have marks on them, especially the orange types as in ocelaris and percula that show this more then most. But this thread was about black ich right. 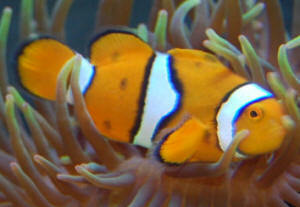 An amphiprion has a generic mucus coating capacity directed at the average range of anemones only! This is to enable it to not be stung to any great degree while it consumes the new anemones signature mucus and synthesis this and produces its own as its mucus coating to make the anemone believe that nothing is there. It is to reduce drag as they swim. It is to house part of the fish’s immune system. It can only fail when the clown is under stress and part of that response in the reduced production of this and the natural chems it makes for parasitic protection that are in that mucus. Just like our immune system if it is weakened or fails from when we are stressed or are sick! Hyper melanization is a result of the foreign type of mucus the clown fish has consumed and is trying to synthesise that is not in its make to be able to do this. So its pores become infected/inflamed initially and may spread out by trying to do this and will show short term scaring if it does not continue. If it keeps expanding the fish is history. Large marks that may get larger,is hyper--- or damage from scratching,fisghting or sickness or ammonia burns,etc,etc.